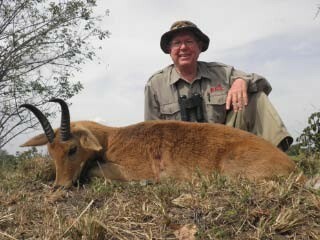 Chris Weth of Uganda Wildlife Safaris reports that his first hunter has started off the 2011 season with a bang ... actually 5 bangs on East African Sitatunga, Nile Buffalo, Nile Bushbuck, Jackson's Hartebeest, and East African Bush Duiker. 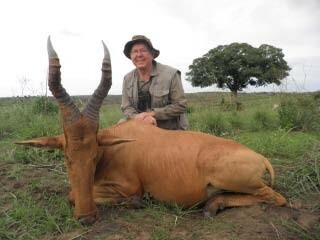 Sitatunga and Buffalo are a great double to complete on any safari. We don't yet have photos, so following are three from the 2010 season. The 2011 season lasts all the way through November and there are still limited openings. For pricing, click on Uganda Safaris to the left. 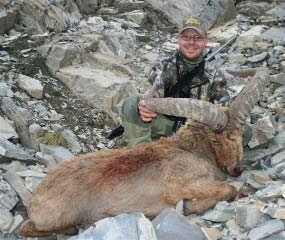 The big game hunting season in Iran just ended. 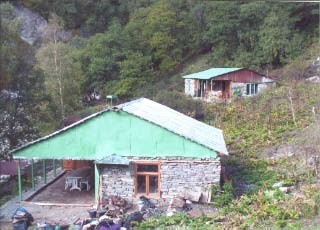 Now is the time to book for the October 2011 - February 2012 season. 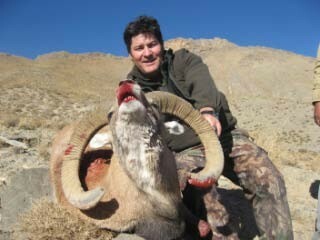 Jasmin Safaris, one of the three licensed outfitters in Iran, still has some openings for the 2011 - 2012 season. Go to www.sportsmenonfilm.com and click on Iran for pricing. Ken Wilson has booked his 2011 Iran itinerary as follows: Fly U.S. - Frankfurt - Tehran Oct. 30-31. 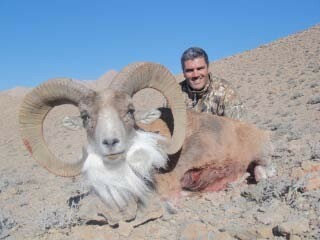 Hunt and travel Iran Nov. 1-22. Return to the U.S. Nov. 23 (just in time for Thanksgiving). There are still two openings to join Ken or call him to book your own dates October - February. The hunting season for Eastern Tur is June 1 - December 20. There are very few openings remaining with our outfitter for 2011, but 2012 is fairly open. The price is only $7,500 and you can shoot a second Tur for only $3,500. Depending on your physical condition, the climb from base camp #1 takes 3-4 hours, from base camp #2 takes 4-5 hours, and from base camp #3 takes 4-8 hours (the different times depend on your climbing speed, because the guides travel at the rate with which each hunter is comfortable). Once on top, you fly camp on top until you shoot your Tur(s). You make the climb only once. Call Ken at 800-910-HUNT to discuss openings ... the best time of year to hunt vis a vis your condition ... the use of horses, etc. 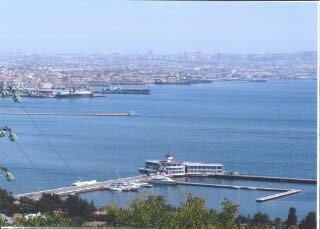 Ken has booked his 2012 Azerbaijan itinerary as follows: Fly U.S. - Baku July 7-8. Transfer to base camp July 9. Hunt July 10-14. Back to Baku July 15. And return to the U.S. with your trophy (trophies) July 16. As of now two openings remain to join Ken, or put together your own group. 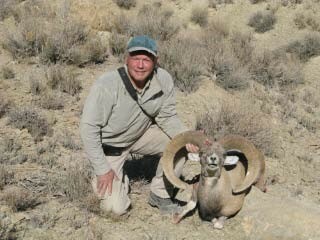 Ken and Lad Shunneson have sold all 4 of our outfitter's 2011 Tule Elk hunts and all 4 for 2012 also. Our 2011 hunters are scheduled for July - August. After they finish, we will set prices and open bookings for 2013. There is no charge to get on the waiting list for 2013. Ken Wilson and Lad Shunneson have hunted together and videotaped hunting on six continents ... so they get along even though one has an over-the-top personality ... one is Nordic and one is a mongrel ... one tells unbelievable stories ... one has shot 50 Black Bear and 50 Mule Deer ... one has The Ring ... and one is Mutt and one is Jeff. Starting in 2012, S & W will combine their booking business and share convention booths for several hunting shows. Lad will specialize in North America big game and fishing (he currently fishes and accompanies clients over 6 months every year) ... Ken will specialize in Africa and Asia and they will both work on the numerous countries and hunts available in Europe and the limited hunts and countries available in South America and the South Pacific. Central African Wildlife Adventures just had a cancellation for April 7 - 28 in their prolific and huge eastern concession. 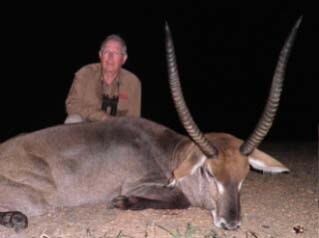 You can select 1, 2, or all 3 weeks at a GREATLY REDUCED PRICE for Lord Derby Eland, Bongo (they have both forest and savannah species), Buffalo, Giant Forest Hog, Yellow Back Duiker, and many more great trophies. Call Ken at 800-910-HUNT as soon as possible for more details.